Found 15 file extension associations related to oXygen XML Editor and 10 file formats developed specifically for use with oXygen XML Editor. 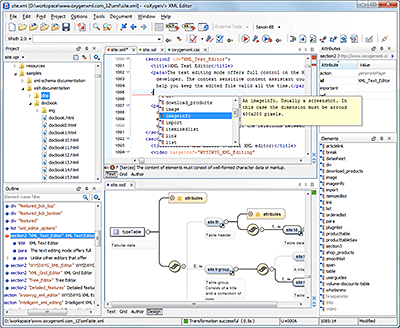 Developer / company: SyncRO Soft Ltd.
oXygen XML Editor is the best XML editor available, with a large number of users ranging from beginners to XML experts. It is the only XML tool that supports all the XML schema languages. The XSLT and XQuery support is enhanced with powerful debuggers and performance profilers. You can use XML Editor to work with all XML-based technologies including XML databases, XProc pipelines, and web services. If you need more information please contact the developers of oXygen XML Editor (SyncRO Soft Ltd.), or check out their product website.